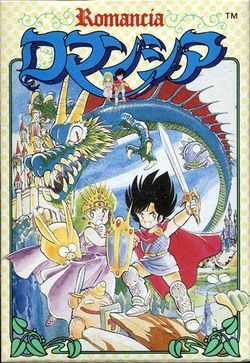 Dragon Slayer Jr: Romancia (ロマンシア Romanshia in Japanese, also known as Dragon Slayer III) is an action-adventure game developed by Falcom in 1986 for the NEC PC-8801, NEC PC-9801, MSX, MSX2 and Sharp X1 computers. A Famicom version was retooled and expanded by Compile and published by Tokyo Shoseki. It is the third in the Dragon Slayer series, preceded by Dragon Slayer II: Xanadu and followed by Dragon Slayer IV, though, as most games in the Dragon Slayer series, have no relation to each other outside of a few gameplay concepts. Romancia is a very simple and brightly colored game in comparison to the other Dragon Slayer titles, hence the name "Dragon Slayer Jr."
Romancia's style is fairly simple. Unlike Xanadu, there are almost no statistics, and zero customization. The game consists largely of two screens with a few small sub-areas. In the original PC versions, the player has only thirty minutes to complete the game, further illustrating the light and accessible nature of the title versus the oppressive underground complexes of Xanadu. Despite this, the game is still rather unforgiving and the player will likely use trial-and-error or a walkthrough to solve some of the puzzles. Romancia is seen as the inspiration behind Falcom's superior title Sorcerian, which even includes a stage based on this game. An enhanced remake was released for Windows in 1999 by Unbalance. This game was never released outside of Japan. However, the Famicom and MSX versions have received a fan translation. The Famicom translations is notable for being the first to feature variable width font, and the patch can be found here. The MSX1 translation patch can be found here and the MSX2 translation patch can be found here. Once there were two small kingdoms north of a forest on a vast continent. These kingdoms were ruled by two kings who were brothers. One brother ruled the kingdom of Romacia, and the other brother ruled the kingdom of Azoruba. Residents of both countries spent their days in quiet peacefulness. Until one night, that peace was shattered. Someone broke into the Castle of Romancia and kidnapped princess Serena. The kidnapper was seen taking her toward the neighboring kingdom of Azoruba. The King of Romancia immediately assembled his finest warriors to rescue her. They were sent to Azoruba, and never heard from again. Shortly after, a disease began to spread among the citizens of Romancia, and monsters began to appear on the outskirts of the kingdom. People were in despair. One day, a young man who was traveling happened to arrive at Romancia. His name was Freddy Fan. He was a prince from the kingdom of Irusuran. He traveled to many countries, but got lost in the great forest known as the Lost Woods before emerging in Romancia. As he walked around the kingdom, he noticed that the citizens were frightened, and some sobbed with sadness. He had to know what happened to the kingdom. Visiting the castle, he requested an audience with the king. The king informed him of the sad events which transpired and begged Prince Fan to rescue Princess Serena, and restore peace to the kingdom. This page was last edited on 14 November 2013, at 17:56.